"These boots are are provided from an in-stock selection provided by Ferrini as they are "made-to-order" boots. Prior to shipping these boots to you, we will inspect the boots quality purposes. Please, allow a additional 7-10 business days if they are in stock in the Ferrini warehouse; otherwise if they have to be specially made it can take up to 2 months to receive your boots." These exceptional quality cowhide boots are handmade by one of the finest exotic boots manufacturers, Ferrini. 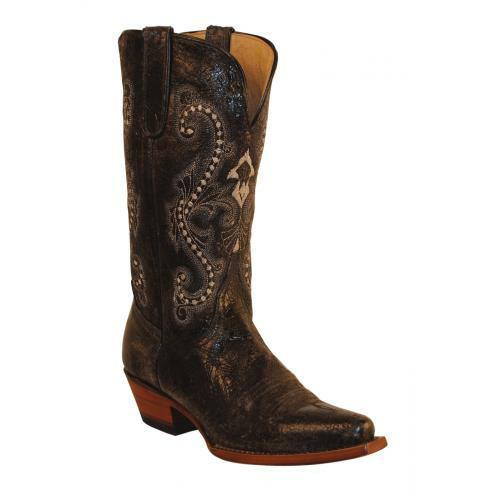 Ferrini offers sensational cowhide boots that are completely hand crafted and hand stitched. The inside is a butter soft lambskin leather for superior comfort and the sole is handstitched in leather for excellent traction. The insole is cushioned for added shock absorption. These boots will fit up to a "B" width due to the soft lambskin interior . Ferrini doesn't use the "painted-on" process to color these boots like other manufacturers; instead, they use a special tanning process to glaze the premium cowhide. Ferrini's main focus is quality and main direction is aggressive high-profile fashion footwear. From television to music videos to recording artists, the Ferrini brand has been seen all over the world.